Ever since the eruption of the Eyjfyallajokull volcano in Iceland I have been monitoring the seismic activity on that island, looking to see if there are any signs that Katla, the larger volcano next along the divide, showed any signs of becoming active. 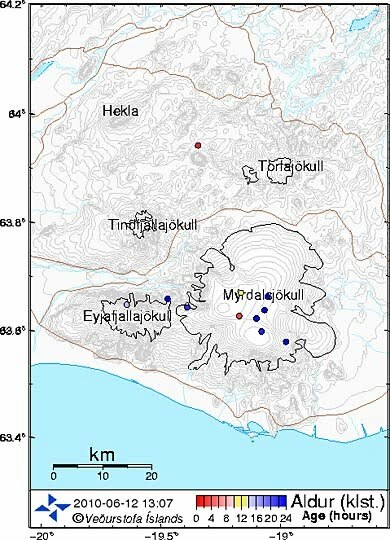 But, while there has been some significant and continuing small earthquake activity up in the area of Laki, the ground under the Myrdalsjokull glacier, where Katla is located, has been relatively quiet. However there have been some signs of activity around Katla in the last 24 hours that seem to align along possible fissures, suggesting that the region is starting to become a little more active. As yet it is not at any great level of activity, but it is worth noting. Katla, if you remember, is generally a much larger eruption than Eyjafyallajokull with a much more significant impact, and has followed it in erupting in the past. 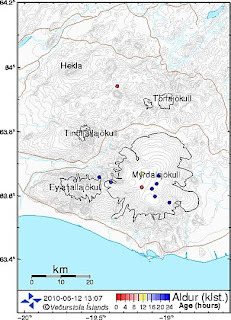 UPDATE: While preparing my next post (the one above) I glanced back and there are a couple more little quakes in the region under Mydralsjokull in the last 24 hours. Still nothing big, but consistent in alignment. If these get bigger and shallower, life could become even more interesting.